Deciding which machine to purchase can be stressful. Your best bet is to understand how each machine works and the differences between each one. If you're looking for shaved ice, we have a great infographic illustrating the differences in cube and block ice shavers. 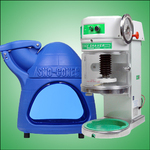 Your snow cone or shaved ice machine will be the lifeline to your business. Without high quality, dependable machine, your business cannot survive. In terms of fluffiness, we often compare snow cones and shaved ice on a "Fluffiness Scale" from one to ten. One being ice chips and ten being like snow. Shaved ice would rank anywhere from seven to ten, depending on the machine. Snow cones would rank from four to six. 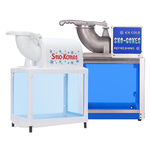 We carry a large variety of shaved ice and snow cone machines that will meet the heavy demands of any shaved ice or snow cone business. All of our machines are made with the highest standards to provide years of durability and service. Shaved ice machines accept one of two types of ice. You may choose a cube ice shaver or a block ice shaver. You'll notice on the fluffiness scale above that you'll get the fluffiest possible snow with a block ice shaver. When choosing your machine, fully understand the direction you'd like your business to go. Consider future growth and possibilities. If you're interested in a snow cone machine, you may get overwhelmed. There are so many snow cone machines to choose from and each one is slightly different. They may be constructed from durable polyethylene to sturdy stainless steel. Some machines include display cases and others you simply shave into a bin. 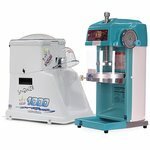 We have great resources to help you choose, so keep reading through Shaved Ice University and you should have a good idea which type of machine you need. We have a video for nearly every machine we offer. I suggest visiting each machine page (see my recommended products to the right) and watch how the machines operate. Brittany has done a wonderful job demonstrating and explaining the features. As always, call us if you ever have questions. Our toll-free phone number is 1-800-742-8334. You may ask for myself, Carli, or any other member of our team. We are here to help you.